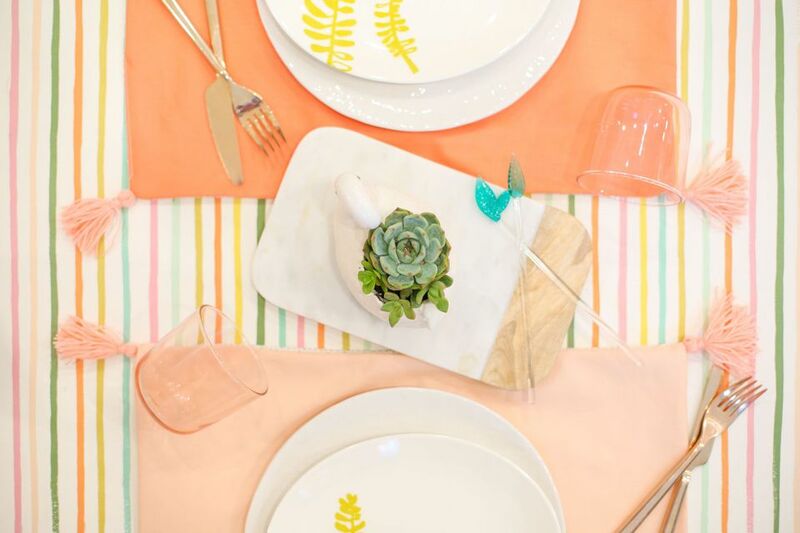 There are so many opportunities that call for a beautiful table setting! With so many parties and dinners on the horizon, it's the perfect chance to get your table setup on point! These reversible tassel placemats add a fun touch to your table setting, and would even make a perfect hostess gift if you're headed to a holiday party. So fire up your sewing machine but don't be worried—these are simple to make even for a novice sewer. Start with your favorite fabric–if you'd like to make these reversible, think of the combination of fabrics from front to back. We used a few different shades of solid fabric on one side, and the same patterned fabric for the reverse of each placemat. Cut each piece of fabric to a 19" x 14" rectangle. Pin right sides together of two pieces of fabric. Sew around the edges with a straight stitch, leaving a 2" gap along one side. 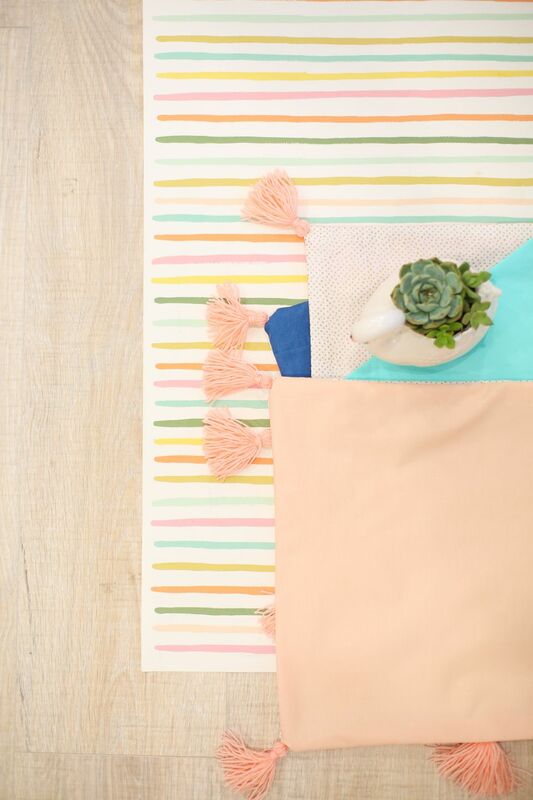 Sew all of your placemats together in the same fashion. Once they're sewn together, flip them all right side out by pulling the fabric through the gap. Get a scrap of cardboard that's about 3" wide. Wrap the yarn about 30 times around the cardboard. Slip an 8" piece of yarn under all of the layers that you wrapped, and double knot this piece around the top of all of the yarn loops. Gently pull the wrapped and tied yarn off the edge of the cardboard. You should now have all of the loops of yarn being held together by the piece tied around their tops. Cut an 18" piece of yarn. Leaving a 3" tail, start wrapping the yarn around the top of the tassel. Wrap approximately 10 times and double knot it to itself, letting the ends trail down to become part of the tassel. Use scissors to trim the bottom of all the loops so that the ends of the tassel are even. Thread your embroidery needle with one end of the yarn that you used to tie all the tassel loops together. Insert this on one corner of a placemat, from the outside in. Allow that piece to hang inside while you rethread your needle with the other end of the yarn and insert this end through the corner as well. Once both pieces are sewn through, tie them together in a tight double knot. Repeat with all tassels, sewing one to each corner of each placemat. Set your table and have a great celebration!